Sunday, September 12, 2010 1pm to 4pm � Grandparents Day. Music and complimentary citrus juice will be served and citrus-theme arts & crafts will be available for children. Juice and activities included with paid admissions to view the exhibit. More than 20 Lilly collectors have provided vintage items for the display in the exhibit that is featuring nearly 100 vintage Lilly clothes, accessories, home furnishings and toys. More than fifty years ago, a wave of bright, bold and unique prints in the form of pink monkeys dancing, green elephants swimming and flowers blooming in rainbow colors hit the American fashion scene. It all started when Lilly Pulitzer, a young, New York socialite, opened a juice stand in Palm Beach in the 1950s. The citrus stains that splashed upon her clothing inspired her to create brightly colored designs to help camouflage those stains. These designs ultimately became the unofficial uniform for the affluent, and Lilly�s signature pink and green colors emerged as the banner of the authentic Palm Beach lifestyle. In 1959, Lilly became president of her own fashion company Lilly Pulitzer, Inc.
Born Lillian McKim in Roslyn, New York she married Peter Pulitzer of the famous Pulitzer Prize family. The family settled in Palm Beach where a free-spirited Lilly Pulitzer operated a juice stand using produce from a citrus grove owned by the family. The initial style of the Lilly clothing designs were simple shift dresses that appealed to a wealthy client base that included Lilly�s boarding school friend Jacqueline Bouvier Kennedy. And others who wore the Lilly designs were various descendants of the Gilded-age titans that included the Rockefellers, Vanderbilts and Whitneys. Because the Lilly style was so strongly associated with blue-blood high society, Lilly Pulitzer became known as the �Queen of Prep�. Lilly Pulitzer, Inc. thrived with more than 30 stores eventually offering wares for children, men and the home until the company closed its doors in 1984. During the company's operation in the 1960s to 1984, it had a factory located in Miami, Florida on 29th Avenue between 34th Street. And, the fabrics were manufactured by the Key West Hand Print Fabrics company that was located in Key West, Florida. The fashion line re-emerged again in 1992 when the rights were purchased by Sugartown Worldwide, Inc. The For the Love of LILLY exhibit is being organized and developed by the Museum of Lifestyle & Fashion History and is scheduled to be on display August 3, 2010 thru May 31, 2011 at the donated location for the Museum of Lifestyle & Fashion History at the Boynton Beach Mall in Boynton Beach, Florida. The exhibit will include various educational programs about design. Mural art inspired by the iconic prints in the Lilly Pulitzer designs has been created by Boca Raton High School student, Skyler Carosella. Skyler is a resident in Boca Raton and hopes to pursue a career in fashion. Additional mural art was designed by Natalie Nelson of Boynton Beach, FL. Owners of Lilly items were invited to loan their vintage Lilly clothes, accessories, home furnishings and photos for display in the exhibition. To date, 20 collectors from throughout the USA and the State of Florida have provided their vintage Lilly for the exhibit. Some collectors are from Cincinnati, Ohio; San Francisco, California; Shingle Springs, California; Philadelphia, Pennsylvania; as well as from cities in Florida such as Orlando, Wellington, West Palm Beach; Boynton Beach; Delray Beach; Hillsboro Beach; Pompano Beach; Fort Lauderdale; Parkland and Miami. 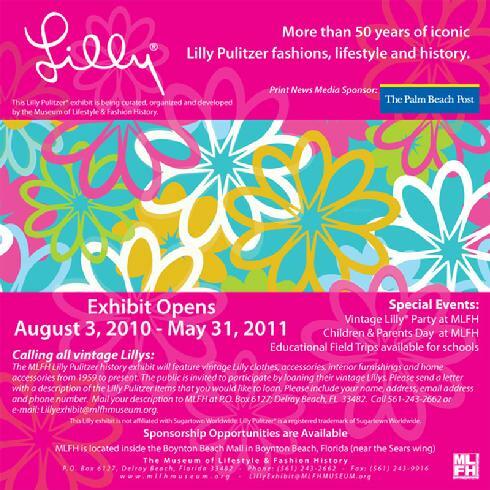 MLFH developed a curriculum partnership with the Miami International University of Art & Design for the LILLY exhibit. Students created designs that were inspired by the iconic Lilly Pulitzer designs. Some of the student Lilly-inspired fabric designs will be in the exhibit too. School field trips are also available for the exhibit as well as through the museum's Mathematics in Design program for grades Pre-K through 6th grade. Mathematical geometric shapes will be highlighted as a part of the exhibit for the field trip. Sponsors, to date, include the Boynton Beach Mall-Simon Malls, US 1 AC Storage of Boynton Beach, the Patricia Ann Ravo Fund, the Boris & Edith Rueger Fund and The Palm Beach Post. Sponsorship opportunities are still available. 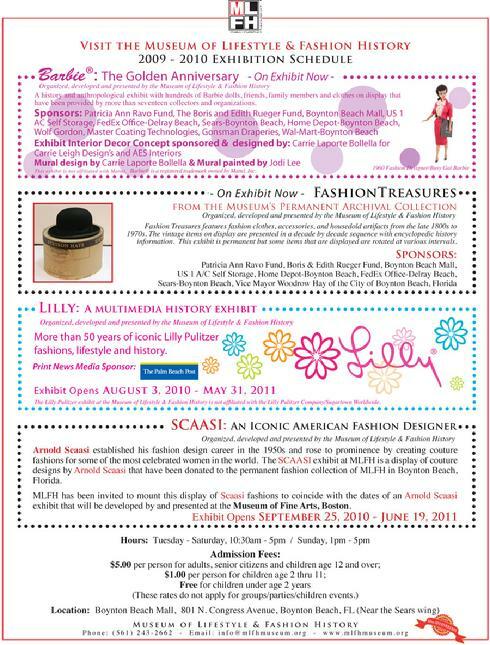 If collectors would like to loan vintage Lilly items for display, they need to mail or e-mail a brief list of their Lilly items to Lillyexhibit@MLFHMUSEUM.org or mail to Museum of Lifestyle & Fashion History at P.O. Box 6127, Delray Beach, FL 33482. For more information, call 561-243-2662. - Fashion Treasures from the Museum�s Permanent Artifact & Fashion Collection. "Calling all Lilly Fashion items"
Boynton Beach, Florida (Palm Beach County)--- More than fifty years ago, a wave of bright, bold and unique prints in the form of pink monkeys dancing, green elephants swimming and flowers blooming in rainbow colors hit the American fashion scene. It all started when Lilly Pulitzer, a young, New York socialite, opened a juice stand in Palm Beach in the 1950s. The citrus stains that splashed upon her clothing inspired her to create brightly colored designs to help camouflage those stains. These designs ultimately became the unofficial uniform for the affluent, and Lilly's signature pink and green colors emerged as the banner of the authentic Palm Beach lifestyle. 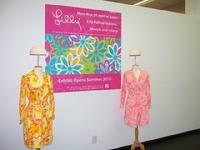 In 1959, Lilly became president of her own fashion company Lilly Pulitzer, Inc. The initial style of the Lilly clothing designs were simple shift dresses that appealed to a wealthy client base that included Lilly�' boarding school friend Jacqueline Bouvier Kennedy. And others who wore the Lilly designs were various descendants of the Gilded-age titans that included the Rockefellers, Vanderbilts and Whitneys. Because the Lilly style was so strongly associated with blue-blood high society, Lilly Pulitzer became known as the "Queen of Prep". Lilly Pulitzer, Inc. thrived with more than 30 stores eventually offering wares for children, men and the home until the company closed its doors in 1984. The fashion line re-emerged again in 1992 when the rights were purchased by Sugartown Worldwide, Inc. The LILLY exhibit is being organized and developed by the Museum of Lifestyle & Fashion History and is scheduled to be on display August 3, 2010 thru May 31, 2011 at the donated location for the Museum of Lifestyle & Fashion History at the Boynton Beach Mall in Boynton Beach, Florida. The exhibit will include various educational programs about design. Owners of Lilly items are invited to loan their vintage Lilly clothes, accessories, home furnishings and photos for display in the exhibition. If anyone would like to loan vintage Lilly items for display, they need to mail or e-mail a brief list of their Lilly items to Lillyexhibit@MLFHMUSEUM.org or mail to Museum of Lifestyle & Fashion History at P.O. Box 6127, Delray Beach, FL 33482. Deadline to respond to the Call is April 30, 2010. For more information, call 561-243-2662. Current exhibits presently on display at MLFH are Barbie�: The Golden Anniversary and Fashion Treasures from the Museum's Permanent Archival & Artifact Collection. The Museum of Lifestyle & Fashion History is a non-profit 501(c) 3 history museum that was established in 1999. The inspiration for the Museum of Lifestyle & Fashion History of Delray Beach was the phenomenally successful popular culture & retrospective exhibit "40 Years of the Barbie� Doll" in celebration of Women's History Month which was on display from March 1999 thru September 2000 in Delray Beach, Florida. Mattel, Inc, loaned from their archives to Durante nearly 80 Barbie� dolls for display in the exhibit. More than 20,000 visitors from around the world attended this exhibit which made it the #1 attended exhibit in the history of Delray Beach and one of the most memorable Museum exhibits in all of Palm Beach County. The Barbie� Doll exhibit was conceived and curated by Lori J. Durante who is the Executive Director/Chief Curator of the Museum of Lifestyle & Fashion History. The Museum of Lifestyle & Fashion History (MLFH) has been raising monies to acquire property for a proposed museum facility for the purpose of presenting permanent and traveling exhibits. The Museum of Lifestyle & Fashion History has been the only museum in Palm Beach County approved to host traveling exhibits from the Smithsonian Institution. When the Museum was located in the donated space in a shopping center in downtown Delray Beach a number of exhibits from the Smithsonian were hosted. That shopping center has been sold and demolished for redevelopment. A building is very much needed by the Museum to once again bring exhibitions to this area from the Smithsonian as well as artifacts from around the world. For the permanent building for the Museum, there are many naming opportunities available as well as other donation and sponsorship categories. In 2009, MLFH opened in a temporary donated 8,000 square feet facility at the Boynton Beach Mall in Boynton Beach, FL. MLFH will be at this location for at least three years while fundraising efforts still continue for the permanent building. The Museum of Lifestyle & Fashion History is a non-profit museum that was established in year 1999. The mission of the Museum is to offer educational programs, and history and retrospective anthropology exhibits showcasing lifestyle, cultures, people, places, fashion trends, clothes, architecture, furnishings, decorative arts, interior designs, locomotives and toys, and information about popular uses of artifacts by people/events of various periods of time. The goal of the Museum's mission is to collect and preserve objects and artifacts that relate to the Museum's mission; provide educational & cultural arts programs for children, families, the general public and the economically disadvantage; and the goal is to enhance tourist attractions and the economy of the area. The Lilly Pultizer exhibit at the Museum of Lifestyle & Fashion History is not affiliated with the Lilly Pulitzer Company/Sugartown Worldwide. Lilly Pulitzer is a registered trademark of Sugartown Worldwide.